At one time or another, we've all indulged in the optimism that leftover pizza will come close—or even surpass—how good it was when the pie was fresh. And that means, at a minimum, hot. The allure of cold pizza is mostly imaginary, romanticized by writers of bad screenplays and others prone to nostalgia for a time that never existed. Therefore, leftover pizza needs to be reheated and there are a number of ways to do so. We'll discuss and rank each method from worst to best. If you want to reheat half a pizza or more, you're pretty much limited to reheating it in the oven. That's one of the techniques we'll describe below, but first, let's talk about the elephant in the room. Or should we say, the appliance in the kitchen? That's right, presenting the microwave. For most people, reheating food usually means zapping it in the microwave for a minute or two. And why not? It's quick, it's easy, and it doesn't heat up your entire kitchen. And while it's true that this method will indeed reheat any food, anyone who's tried reheating a slice of pizza in the microwave has found that the result leaves something to be desired. If you've tried this technique before, you've probably noticed that the crust feels quite soft when first removed from the microwave, but within a few seconds, that warm pillow turns hard and brittle. What happened? The answer is, well, science. Flour (which is what pizza crust is made from) consists of protein (called gluten) and starch, and starch, in turn, is comprised of a pair of sugar molecules. Microwaving the pizza causes those sugar molecules to melt when it reaches 212 F. This is why your microwaved pizza initially felt so soft and fluffy. But when it cools, those sugar molecules recrystallize and harden, causing the crust to become, first chewy and then ultimately, hard and brittle. The effect will be greater or lesser depending on the makeup of the particular dough, but in general, it's the same for all pizza. It also varies depending on how long you heat it for or what power setting you use. And power setting is just another way of describing how long you heat it for. In other words, microwaving something at 50% power means the oven is only emitting energy for half the time the food is in there. The power setting is also the key to the fact that it IS possible to reheat pizza in the microwave and have it turn out edible. It's simply a matter of keeping the power low and not leaving it in for too long. We mentioned before that the melting point of the sugar molecule is 212 F. Your goal is to heat the pizza without it reaching 212 F. Microwaves vary, but try setting yours to 30 to 40 percent power and heating the pizza for 45 seconds. Check and repeat as necessary. The bottom crust won't get crispy. But since cheese melts at around 120 F, your pizza will warm up and the cheese will be gooey without the crust becoming brittle. Note: You can also heat it partially in the microwave and then finish it in a toaster oven. This is a great technique to use if you have no oven or stovetop, like a dorm or an office kitchen. Reheating pizza in a skillet on the stovetop is a great method, especially if we only have a slice or two. Doing it this way retains the crispiness of the bottom crust while melting the cheese and heating the toppings all the way through. As with so many things, a cast-iron skillet is wonderful for this, but it takes a long time to heat up, and it stays hot for a long time, which may well conflict with your goal of keeping your kitchen as cool as possible. So a stainless steel skillet is fine, too. Coming in on top is, yes, the oven. The ideal temperature for reheating pizza is 350 F and there are several ways to get your pizza into eating shape. You can put it directly on the oven rack, which can be messy, but will allow for the most even heating of both top and bottom. A sheet of foil is fine, and if you want to avoid it getting too crispy, you can use a sheet pan. On the flip side, if you want it extra crispy, let the sheet pan heat up in the oven before placing the pizza on it. 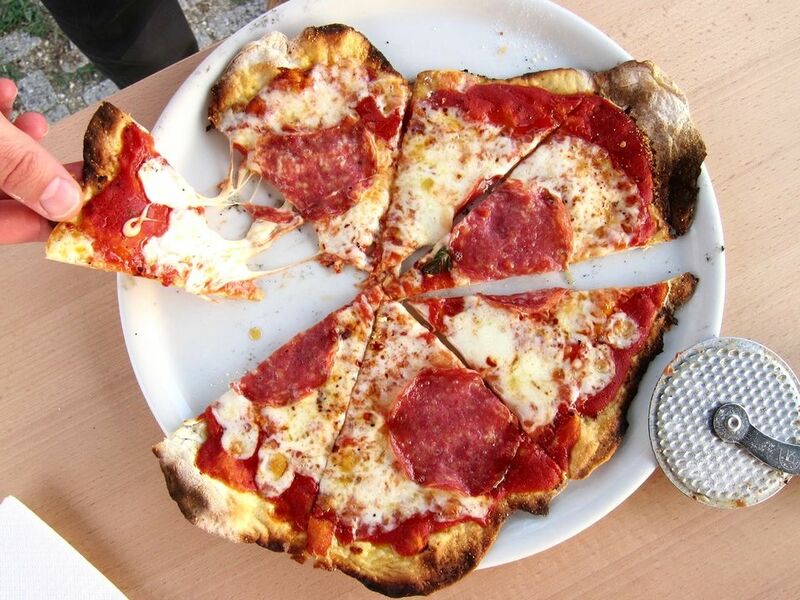 Likewise, if you have a pizza stone and want to go all out, go for it. The issue, of course, is that it takes a pizza stone ages to heat up, and you might not want to wait just for a slice of pizza or two. The downside, of course, is that it's terribly inefficient to heat up an entire oven just to reheat a slice of pizza. The efficiency increases with the more slices you have to heat up, however. And, as we mentioned a moment ago, the conventional oven is the only method that will produce sizzling pepperoni, which is why, overall, heating it in a 350 F oven is our favorite way to reheat pizza. Does Whole Foods' Refrigerated Pizza Dough Make the Cut?